Bronze baby shoes are a way of preserving the scuffed little shoes of those precious first steps. Though popular in previous generations, bronzing shoes fell out of fashion for a while. The process was messy, involving plaster and an electroplating finish to allow the bronzing to adhere to the shoes. And it was not exactly inexpensive, which was why most people. However, in recent years, changes have been made in how shoes can be preserved, and parents have different options they can explore. Back in the day, parents were pretty much limited to a bronze finish on the shoes. These days, you have more options. 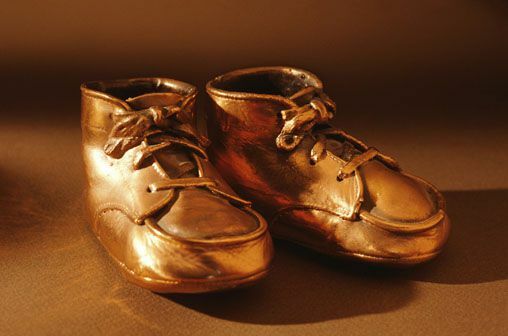 You could have your baby's shoes plated in traditional bronze, bright bronze, gold, silver, pewter or porcelain. Companies then finish the shoes off with a coating of protective lacquer. If you would like to bronze the shoes at home, you can purchase a kit ranging from $80 to $400. However, if you'd rather leave it to the professionals, prices can vary significantly, depending on what type of finish you want and if you want the shoes joined to a picture frame. You'll probably have to pay for shipping as well, so factor that expenses into the total. It's a fairly involved process and since you'll need to allow drying time in between some of the steps, it can be lengthy. Collect the supplies you'll need (ideally everything will be included in a kit), and set aside space in a well-ventilated area. While wearing gloves, clean and dry the shoes first, removing any laces to be washed and dried separately. Depending on the style, you may want to fill the inside of the shoes with plaster (which also requires drying time) to add a bit of weight. Clean the shoes of any remaining dirt or blemishes with denatured alcohol before applying the bronzing powder per the kit's instructions. Allow it to dry completely. Because polishes can wear down the protective lacquer, it's best to avoid them. Instead, wipe down preserved shoes with a soft, clean cloth. Plated shoes are simple to care for and make beautiful and enduring heirlooms. In addition to offering complete bronzing services, several websites offer multiple shoe preservation services. But if you tend to be a do-it-yourself kind of person, you can take advantage of mail-order personal bronzing kits.